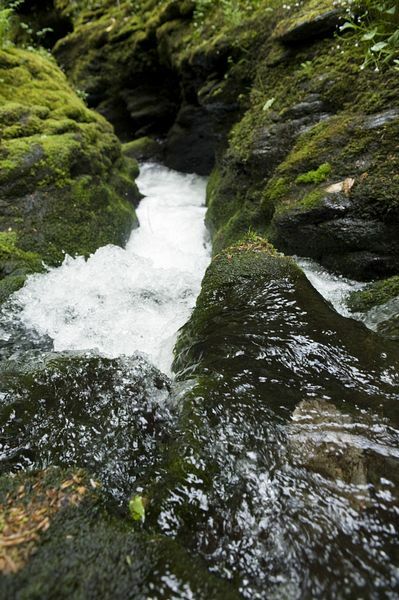 Lyford Gorge is a beautiful natural attraction and is in fact the deepest gorge in the southwest of England. It runs for 2.5km (1.5 miles) along the River Lyd providing beautiful walks. The challenging path hugs the cliff face in places, providing wonderful views of this scenic area. The first sighting of the River Lyd may be from the stone bridge in the ancient Saxon town of Lydford, which has a Norman Castle once used as a prison. The river begins its journey on the wet tors of Dartmoor. Beyond the bridge, the river drops sharply down into Lydford Gorge and soon disappears from view in the tree-lined ravine. avoid missing any of the interesting features such as the well-located bird hide along the disused railway from which local birds can be watched. Shortly after leaving the bridge the swirling waters of the Devil's Cauldron are a source of fascination for children and adults alike. The potholes and black rocks are battered by the swirling white whirlpool which can be seen from the special viewing platform overhead. Tunnel Falls is the secondary waterfall further along the gorge. The lush tree-lined gorge follows the route of the fast-flowing River Lyd as it makes its rapid descent through this steep-sided valley, providing a number of walks, waterfalls and natural sights. There are a variety of paths which run close to the water or along the winding upper path, but all have splendid views of the greenery which clings to the side of this impressive ravine. Good footwear is essential for navigating the steep, uneven and at times slippery paths with some vertical drops in places. Allow at least 2 hours for the return walk which will be a distance of 5km (3 miles) in total. the birdsong above the river's roar, smell the wild garlic which pervades the air in spring, and see the convoluted fungi which form in this damp microclimate during the autumn at this Site of Scientific Interest. 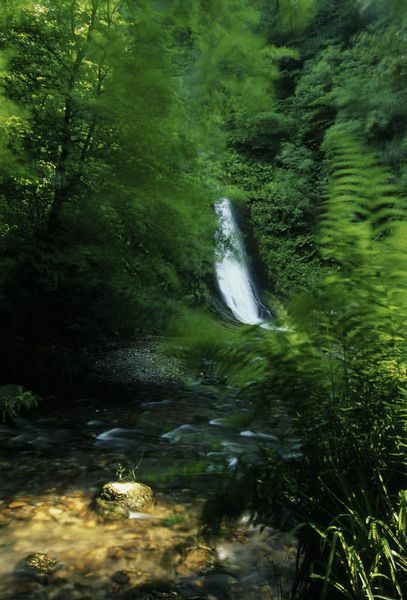 At the south end of Lydford Gorge is one of the main highlights of any visit - the 30 metre high Whitelady Waterfall. It is a favourite spot for herons and kingfishers. Close by is Lambhole Wood with its ancient lime, elm and hawthorn trees. It is a natural haven for wildlife and wild flowers. 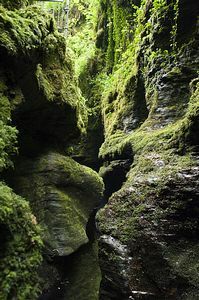 Lydford Gorge has a unique history. It was used as a hideout for the villainous Gubbins family who were outlaws in the 17th century. From their hideaway they rustled sheep from Dartmoor and terrorized the law-abiding farmers in the neighbourhood. In the early 19th century the war against Napoleon halted the Grand Tour of Europe by the wealthy aristocrats and instead sights such as Lydford were visited and appreciated for their spectacular natural beauty. Walks along Lydford Gorge can be started from either end, but the National Trust tea room and restaurant, a strategic point to head to for refreshments, is at the north entrance near the Devil's Cauldron. Holsworthy 118 Tavistock-Barnstaple, bus stop at main entrance and waterfall entrance to gorge. NCN27 and 31. Property is close to three cycle routes: Devon Coast to Coast, West Devon Way and Plym Valley View local cycle routes on the National Cycle Network website. 7 miles south of A30. Halfway between Okehampton and Tavistock, 1 mile west off A386 opposite Dartmoor Inn; main entrance at west end of Lydford village; waterfall entrance near Manor Farm. As road directions or via Blackdown Moor from Mary Tavy.